A new pup joins the Sea Otter Exhibit at Monterey Bay Aquarium. SWEET STORY: Not every denizen at an aquarium happens to be born at the aquarium. Take Pup 572, for example. He was found on a stretch of beach near Cayucos just after the new year. No mom was with the six-pound boy, but he did yield a painful clue to what happened -- a laceration, possibly from a shark bite. The Monterey Bay Aquarium took him in and nursed him, turning him over to Joy, the institution's go-to otter for surrogating wee pups in need (Pup 572 is Joy's 16th otter). 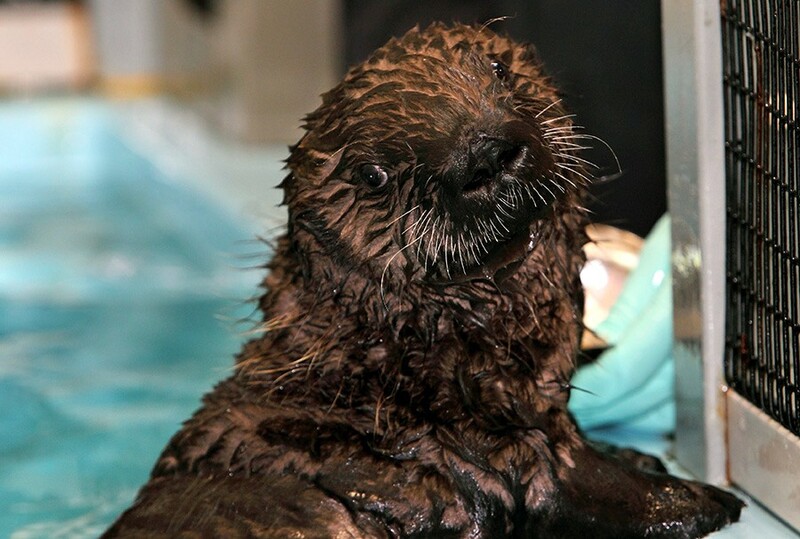 He's doing well, so 572 has just joined the Sea Otter Exhibit at the aquarium as of Valentine's Day. SEE HIM NOW: If you're going to see him. How long he stays depends on his relationship with Joy, say aquarium reps. He's gained nine pounds since arriving in Monterey, and is a "robust, healthy, developmentally normal" little guy (and, of note: He's the youngest pup to ever join the exhibit). The aquarium also said that pups arriving with great white bites are not uncommon. If you can't see 572 in person, you can check out the live OtterCam. Oh, and that slightly sci-fi name, which springs from the fact that he's the 572nd rescued pup? He'll get a new, less-number-y moniker when he heads for a new home (another "accredited facility," note) some time nearer the close of 2012.